Officer Luis Velasquez shares his story of survival for the first time. HOUSTON, Texas (KTRK) -- Memorial and Wilcrest is an intersection that will be forever ingrained in HPD Officer Luis Velasquez's mind. What he saw, what he heard, and what he felt on May 29, 2016. "I'm looking around to see where the gunshots are coming from," said Velasquez. Velasquez was responding to a call on the day before Memorial Day. He ended up in the line of fire. Police said the suspect, Dionisio Garza, started shooting in the area with an assault rifle. Garza fired off more than 200 rounds and 21 of them hit Velazquez's patrol vehicle, police said. The stepmom of the man accused in Sunday's west Houston shooting rampage is speaking exclusively to Eyewitness News. "Most of them were grouped right around here where my head would be positioned," said Velazquez, pointing to the windshield. Fortunately, he wasn't sitting in the front seat and had already gotten out. As soon as he was fired at, he took shelter behind his SUV. Velasquez said as part of his training, he knew to get behind the engine block of the car or take shelter behind the vehicle for protection. Even with that, he narrowly missed a gunshot to his head. "I literally heard the round go over my head," said Velazquez. He said Garza was just 150 yards away. "I didn't want to think of my family. I have two little girls because I knew that would just make me more vulnerable to the situation, so I just thought I was here to do a job and I need to do what I needed to do to help," said Velazquez. He stayed there in that position -- in the heat -- dodging gunfire for 45 minutes. "I felt like there was nothing nobody could do at that time. I felt helpless," he said. 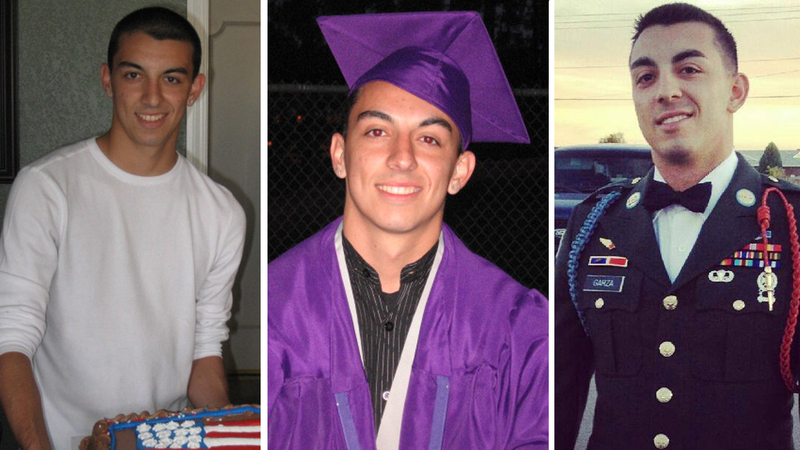 Garza shot six people and killed one before he was killed by an officer. Miraculously, Velasquez was not hurt. Velasquez is grateful he survived, but remembers the life that was lost. He said he would be more at peace if he had arrived to the scene sooner. "To arrive on scene a little bit sooner, being able to engage the suspect before the victim was killed," said Velazquez. Velazquez did save a life that day and become a hero. He saw a citizen that was about to drive into the line of fire and told them to turn around.